Here’s an interesting article from Jon Tudor, reporting on an employee engagement event he recently ran. To summarise, the headline comment from his delegates was: “I wish my board was here, they need to learn and understand this”. Why don’t board-level managers seem to take an interest in employee engagement? After all, they take plenty of interest in change management and transformational programmes. 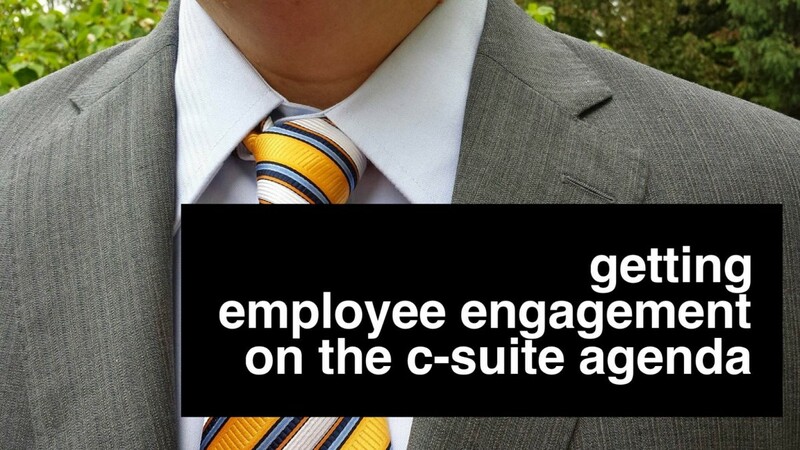 How can employee engagement rise up the agenda? Engagement is a new discipline, and sometimes nobody owns it. A few forward-thinking tech businesses have Chief Engagement Officers, but they’re the exception, not the rule. And whilst engagement feels like it ought to be an HR functional discipline, it has elements of marketing and internal comms too. Unless a business takes pro-active responsibility for engagement, it will fall between today’s functional silos – and won’t land effectively with staff. Engagement gets tarred with the “fluffy” brush. Like many disciplines with ostensibly soft outcomes, engagement is often perceived as ‘fluffy’. We must remember that ‘fluffy’ doesn’t necessarily mean pointless, worthless or non-functional. Executives are martyrs to statistical evidence, and ‘fluffy’ in a C-Suite context usually means ‘lacking in empirical evidence’. There is no formalised metric for employee engagement (yet) – and indeed it may depend on the current corporate context and objectives in your organisation. For now, if you want the top brass to listen, define your parameters (for example an annual employment satisfaction survey or number of sick-days) and define your before-and-after dates (e.g. a six month programme, with measurement at the start and finish). CEOs are firefighting. Now for a more speculative comment. For all that board members are there to take a strategic view, modern CEOs are firefighting and solving tactical problems as much as the rest of us. They are as overburdened as anyone else. Their key skills are the ability to see the long-view, to assimilate problems quickly, to negotiate solutions and to inch forward towards an outcome in discrete, granular steps. Even so, the approach is fundamentally one of handling problems and their solutions. And that’s not a mentality which naturally appreciates employee engagement: there are simply more pressing priorities. It is up to engagement professionals to make the discipline stand out as more than just “a good thing”: rather, it must be presented as the solution to specific business challenges, and with demonstrable outcomes. This is, of course, a close relative of the ‘fluffy’ problem above; but the need here is also for engagement to perform professionally at board level; to become a function of the business.